I give you my Wimbledon Final recipe for this year. I adore these little cupcakes. I get my cases from The Shire Bakery and I hope you'll agree, the sugar-paste flowers and fresh fruit work really well together. Mix together the butter and sugar until light and fluffy. Add the eggs and flour and mix until combined. Now add the milk and vanilla. Divide the mixture between 20 mini cupcake cases. Mix together the buttercream ingredients together in a freestanding machine, whip until light and fluffy, swirl in the strawberry jam. 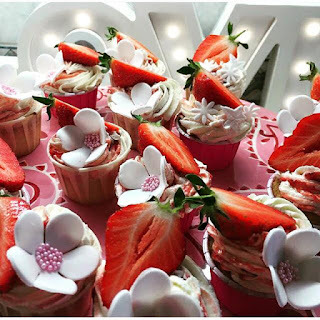 Spoon into a piping bag and pipe small swirls onto the cupcakes, top with half a strawberry and flower-paste flowers. *For raspberry minis:- substitute the strawberry jam for raspberry and the half a strawberry for a whole firm raspberry.